This morning you will be met by your guide at the hotel. Enjoy a cool drink whilst your guide introduces you to Laos and the exciting journey your about to embark on. We then head out on our adventure, commencing with a sightseeing tour of Vientiane, to visit the religious museums of Wat Si Saket, the oldest temple to have survived the Siamese war of 1828 and its cloister containing more than 8000 Buddha statues. Heading across the road to Ho Pra Keo, we visit the former home-temple of the Emerald Buddha statue with its interesting collection of Buddha statues, antiques and array of artifacts found in and around Vientiane. We continue on to the biggest and single most important Stupa in Laos, ‘Pha That Luang Stupa’. Built to cover the original small stupa containing a piece of the chest bone of Buddha, Pha That Luang serves as the main symbolic stupa in Laos. We make a stop for lunch at Khop Chai Deu Restaurant for your first taste of traditional Lao food. After lunch, we continue the sightseeing tour to the National Museum, displaying archaeological artifacts and information on the country's natural history with several rooms devoted to the independence of Laos, from the revolutionary wars to the Vietnam War. A short drive takes us to Patuxay Monument, built quite recently in commemoration of those who died during the wars in the past and it is today as the land-mark of Vientiane. With a climb to the peak of the monument we have amazing panoramic views over Vientiane. We return to the hotel by late afternoon for you to explore the city or just relax and enjoy the sunset along one of the many Mekong River front restaurants. 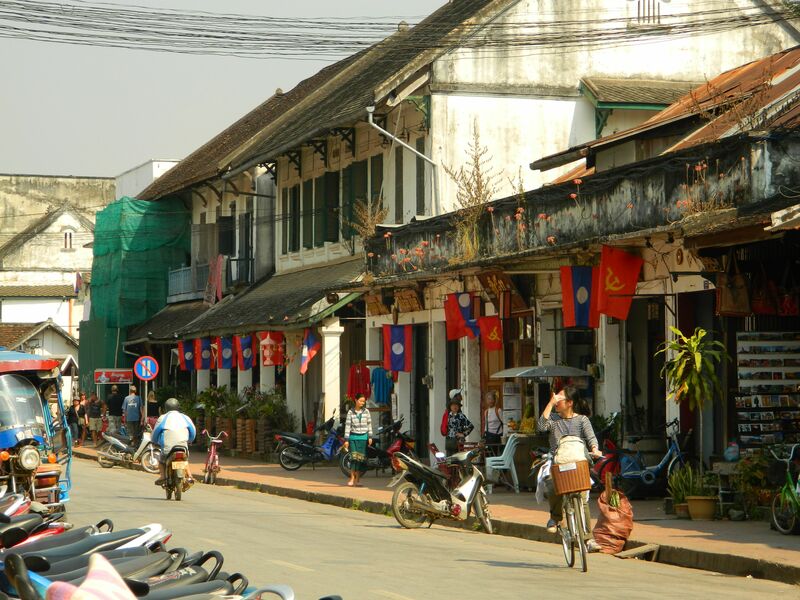 We leave the city of Vientiane behind today on Road No 13, for a spectacular 160km journey to Vang Vieng. On-route, we make a stop at a fascinating Hmong village to visit a local market, where the locals gather to sell their unusual array of local delicacies. Be sure to try some fried grasshoppers! Continuing onto Vang Xang, we stop to visit this interesting Archaeological site, built during the Mone-Khmer Empire between the 8th and 11th Century. 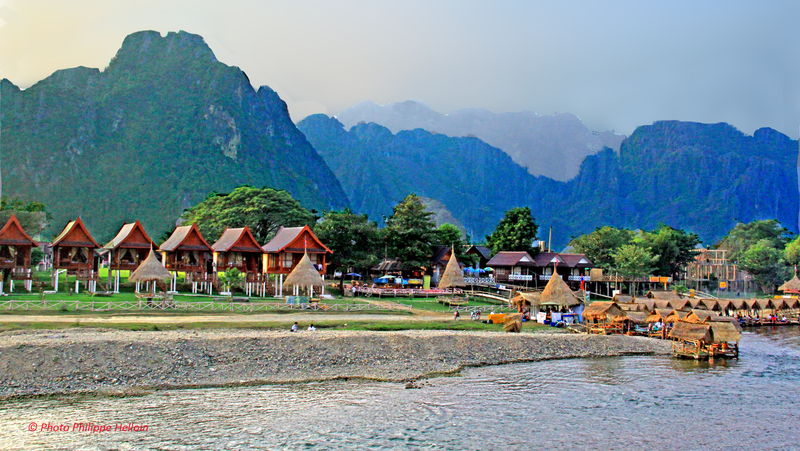 We arrive in Vang Vieng around noon and transfer to our delightful bungalows to freshen up and have a bite to eat at Xayoh restaurant. After lunch we transfer to the Khmu village of Viengsamay, about 10 km north of Vang Vieng to visit ‘Tham Nam Thaem’ cave. This cave cuts straight through the mountain, and emerges on the other side of the range, giving us some panoramic views of the magnificent Nam Kouang valley. We continue on to the Organic Farm, where mulberry tea and a variety of fruit wines are produced. The Tham None Cave lies further downstream. As one of the biggest caves in Vang Vieng, it served as a rescue shelter for the villagers during the Second Indochina War. 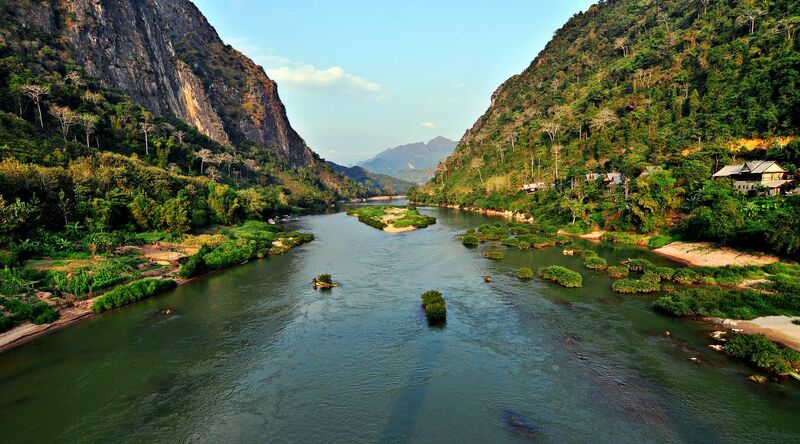 Today it is home to a bat colony and 'The Magic Stone of Vang Vieng'. We return to Vang Vieng in time to catch the sunset from the terrace of the Ban Sabai Riverside Bungalows. After breakfast we start our journey to Phonesavanh. We stop at a local town called Phou Khoun, for some lunch and a stretch of the legs. After lunch, we continue our drive heading to the north east of Laos, through the twisting roads and stunning views, stopping at a Khmu village and a Hmong local village. We arrive in Phonsavan, Xieng Khuang Plateau, home to the Plain of Jars. This enigmatic archaeological site consists of clusters of stone jars, varying in height and diameter from 1-3 meters dotted in the Xieng Khuang landscape. Over fifty sites have been recorded within the province ranging from a single jar to groups containing 400 jars. One local legend states that the jars were originally constructed for an ancient king, whilst archaeological evidence suggests that the jars are funerary urns, carved by Iron Age people around 2,500 years ago. We make a visit to site 1, having the biggest collection of jars with over 250 scattering the landscape and the largest single jar. After our exploration, we head to our magnificent resort for check in and dinner. After breakfast, we return to the Plain of Jars for a visit to Sites 2 and 3, with site 2 being considered to be the most attractive site of them all. With its main group of some 150 jars located on top of a small hill, we have amazing panoramic views of the surrounding plains and farming community within Ban Xieng Dee Valley. After our explorations, we drive around 30km to Muang Khuon, the former Capital of Xieng Khoang Province. 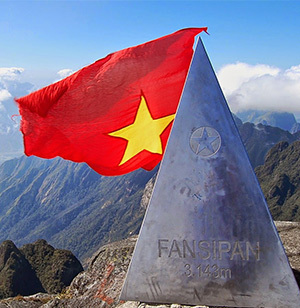 This town was once the Royal Capital and the centre of the Phuan Kingdom. Though the town was heavily bombed during the war, a few French colonial buildings remain in the town centre alongside. We stop for some lunch and continue on to explore the amazing temples of Wat That Phoun a small, rather dilapidated monastery, on the opposite bank of the Mekong River and Wat Chom Phet, both built within the 18th century. Continuing on we stop to visit some intriguing historical colonial buildings as well as the old Lao Military Base, which was seriously damaged by American bombs. On return to the hotel we visit a very interesting local village, where the local people collect scrap metals from UXO and bomb shells to sell, which is their main source of income. We return to the hotel by late afternoon. After breakfast we commence our 262km drive up and over and head out of the mountainous areas through ethnic minoroty villages and admiring the lushness of this scenic route to the beautiful Luang Prabang. On-route we make a stop at Ban Phou Koun for lunch, arriving in Luang Prabang in the afternoon. 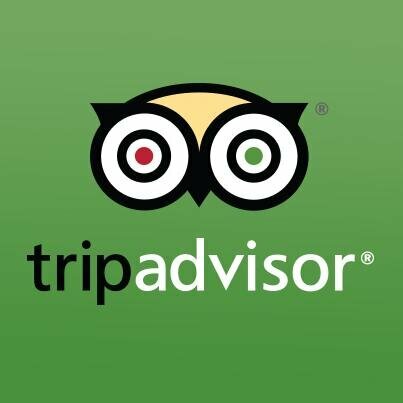 We check into our hotel for a chance to have some free time to relax and enjoy the peaceful atmosphere of this quaint town. After a leisurely morning we take a leisurely sightseeing stroll through this magnificent township. Our first stop takes us to visit the National Museum, which was the former Royal Palace. Built between 1904-1909 the palace is now a museum displaying exhibition galleries and throne rooms. The palace grounds, include a theater, conference hall, garage, boathouse, as well as the ornate Haw Pha Bang. 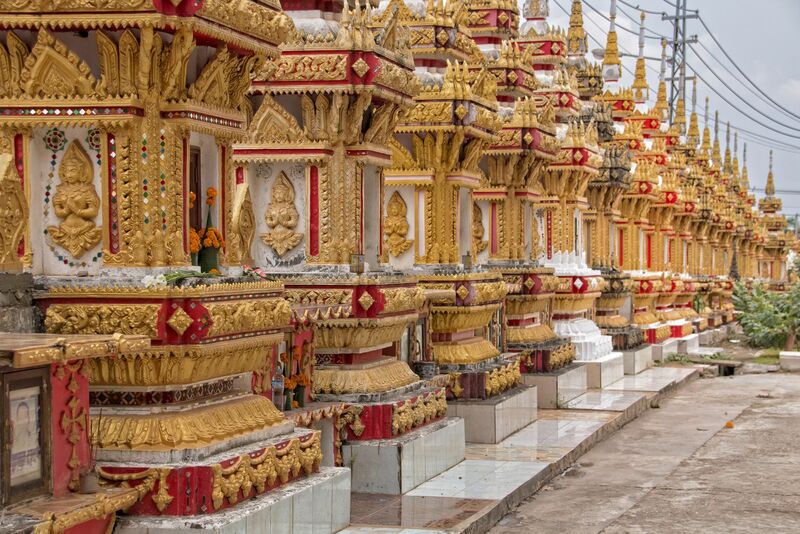 We continue to Wat Mai, the early nineteenth century temple with its most striking feature of the gilded relief panels, covering the front façade and mosaics telling the stories of the highest incarnation of the Buddha – Vessentara. With an orientation of the towns centre, we continue onto Wat Xieng Thong. This temple is a magnificent example of the Luang Prabang traditional architectural style, complimented by the stunning setting along the Mekong River. We return to the hotel by midday to have some lunch and freshen up before heading out in the afternoon to Ban Phanom and Ban Xieng Kong handicraft villages and dinner. We meet our transport around 3.30pm and head out of town to the ‘Tai Lu’ ethnic minority weaving village in Ban Phanom. This fascinating and peaceful village is famed for its intricately woven textiles and special hand weaving techniques, which we will observe. A stroll to the neighboring village of Ban Xieng Kong, we have a very interesting demonstration of the process and art work involved with 'Sa' (Mulberry) paper making, which is then used for a variety of handicrafts such as lanterns, cards, books and gift wrap just to name a few. We have plenty of free time to stroll around the village, admiring the beautiful handicrafts and picking up a few bargains before heading to dinner! Having had the luxury of being cooked for thus far, it’s now time to test your skills! We have the privilege of spending time within a Lao family home to participate in cooking up a traditional Lao style dinner, learning the secrets of all the Lao specialties, from the ingredients through to the intricate techniques. After dinner, we return to the hotel for some free time for you to enjoy the lively night bazaar. This morning’s early rise is certainly well worth the awakening. 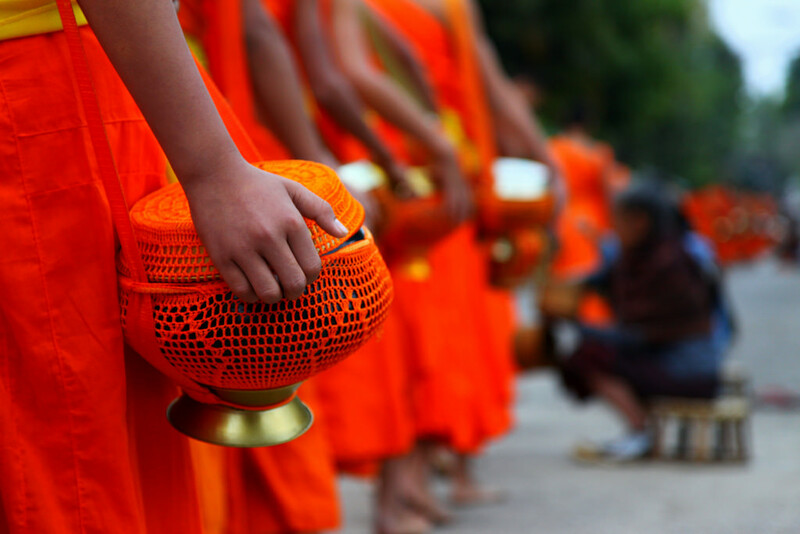 We head to the centre of town bright and early to observe and participate in hundreds of monks walking through the streets, as we take part in the traditional morning ritual of ‘morning alms’ or ‘the giving to monks’. We return to the hotel for some breakfast and a rest before we leave for Laos’s most famous waterfall, Tad Kuang Si (Kriang Si Falls). Passing through the spectacular mountainous areas, we make a stop at a local Khmu and H’mong village where you have a wonderful experience seeing these two ethnic minority groups in their most natural form. Arriving at the falls, we commence an easy walk, from the base of the mountain through the lush forest area, passing by the magnificent turquoise pools and visiting the bear rescue centre, which is set within the falls. Arriving at the base of the waterfall, you have the opportunity to continue up to the peak of the fall or just relax, take a stroll around and admire the beauty and the natural surroundings. After some free time to rest and relax or spend some time bathing in one of the miraculous blue lagoons, we head back down to the base of the mountain to enjoy a spectacular Lao style lunch. We return to Luang Prabang by mid afternoon. This morning we set out on a leisurely cruise on a long-tail boat along the Mekong River, snaking through vine covered hills, observing life along the river with women washing clothes along the banks, kids swimming and splashing about as the dense jungle mountains creep past us. The journey takes around 2 hours upstream and approximately 1.5 hours downstream. Arriving at the confluence of the Nam Ou River into the Mekong, we reach ‘Pak Ou’ or known by the locals as ‘Tam Ting’ Caves. We explore both the upper and lower caves, filled with hundreds of Buddha images, deposited here over centuries and small religious shrines. After exploring the caves, we return to our boat and stop at a magnificent restaurant overlooking the confluence for lunch. After lunch, we continue with a short journey upstream to visit Ban Xang Hai Village. For centuries this village has made the earthen jars used as fermenting containers for Lao wine. Nowadays, it also specializes in producing a wide range of lau lao (Lao whisky) and lau hai (Lao wine). Be daring and be sure to try just a little! We return to Luang Prabang around 4pm. This evening we say thank you and goodbye and would like to invite you to join your guide in a farewell celebration dinner, courtesy of Indochina Travelland.